Encounters that might change a life. If Walsh is Padel's ex-lover, that doesn't bar him from speaking up on her behalf. But a little more transparency might be welcome--perhaps a heart-shaped dingbat in the margin of his column. Meanwhile, he has backpedaled just a bit from his earlier assault on Walcott. "I'm sorry he's withdrawn," Walsh told the Evening Standard. "I just thought it was worth bringing up that, while he is a brilliant poet, his attitudes towards teaching poetry to young people--with a relationship that was overly close--were wrong. It was a moral rush of blood to the head." The most important piece of musical equipment of the last 10 years is not an instrument or a physical object. It's called Auto-Tune and is used on roughly 90 per cent of all pop songs. It is what's known as a 'plug-in,' a specialized piece of software made to be inserted into other, bigger pieces of audio software. 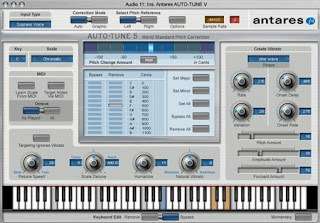 Auto-Tune bends off-key notes into pitch perfection. Of course I knew about the existence of Auto-Tune, and that it was used even by artists with quasi-perfect pitch (check out this recent dust-up between Billy Joel and the pugnacious Ed Champion, who needled the singer for touching up a performance of the national anthem). But I didn't realize how pervasive it was. And yes, off the top of my head, I would have considered it a crutch--a crude cosmetic for vocal blemishes. Clayton argues that in the hands of its most skilled practitioners, Auto-Tune is simply one more expansion of the palette. The human voice is not at war with this vaguely robotic technology. It's "more like glossy coexistence, a strange new dance of give-and-take," with the performer and the algorithm following each other's lead. According to an old theatrical shibboleth, an entertainer who could not project to the balcony's last row was not ready for the big time; Jolson exemplified the leather-lunged belter of songs. With the arrival of the microphone--and the instant exit of the preposterous megaphone--a new and more intimate kind of singing for larger audiences was made possible. Technology changed music. Ironically, mechanics led to a more human and honest transaction between singers and their listeners. Rather than novelty or some warped mimetic response to computers, Auto-Tune is a contemporary strategy for intimacy with the digital. As such, it becomes quite humanizing. Auto-Tune operates as a duet between the electronics and the personal. A reconciliation with technology. This development was sparked by a sexagenarian pop star [i.e., Cher] and spread like wildfire across genre, language, and geography. We live in a world saturated by electronics and we're finding ways to make that situation sing. I would say more, but I can't be hanging around much longer in my striped bathrobe (the blogger's equivalent of a gray flannel suit, and yes, autographed 8X10 glossies are available on request). But if you're following the Auto-Tune debate, you should also check out the smart, quirky Artificating blog. There you can download one of the freakier products discussed in Clayton's article: DJ Champion's "Baako," where a crying baby is fed through the wicked plug-in and sounds like a set of extraterrestrial bagpipes. Walsh is a heart-shaped dingbat. I've been reading this whole sorry account w/great interest. I hesitate to say more, b/c, like you, I fear that once I start I won't be able to stop. Can I have an 8x10 glossy of you in your stripy bathrobe? Perhaps we should consider this as an idea for a project, along with photographs of the places where most writers really do their writing! No purpose-converted lofts or handmade desks allowed. I'm afraid my pick-n-mix pj's would frighten the punters off though. And I do now have a nice table so may be disqualified.